Gotthard II: an extra tunnel but no new traffic. Switzerland. A highly controversial new tunnel will be built alongside the existing Gotthard Tunnel. The southern entrance of the Gotthard Road Tunnel in Ticino, Switzerland. Photo @DriveEurope. The new Gotthard II road tunnel will not increase traffic capacity on the A2 motorway, one of the major routes across the Alps. The Swiss government has approved a plan to expand the access tunnel running alongside the Gotthard Road Tunnel to use while the latter is being refurbished. Renovation starts in 2020 – at the earliest – and will take the best part of the following decade. In addition, the government announced that the number of trucks allowed in at any one time will be limited on safety grounds. 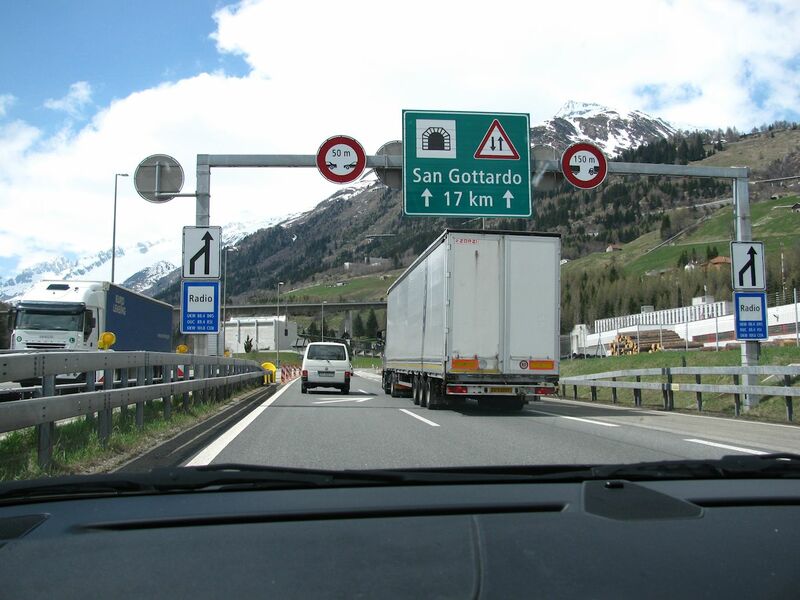 Meanwhile, a plan for a separate Gotthard toll has been ruled out. There was immediate reassurance that the new tunnel will not breach laws which ban the upgrading of transit roads. Like the existing tunnel, the new one will be single lane only. ‘Our project is not aimed at upgrading the tunnel. It is purely a renovation project,’ says transport minister Doris Leuthard. Nevertheless, campaigners Alpine Initiative will fight the plan – which still has to be approved by parliament – saying the money is better spent upgrading rail services. What happens to the new tunnel when the refurbishment is complete will be put to a referendum. The existing Gotthard Road Tunnel opened in 1980. At 10.5 miles it is the world’s third longest. It lies just over half way along the A2 motorway from Basel in the northwest to the Italian border near Lake Como in the south. Over six million vehicles pass through each year including 900,000 HGVs. While Gotthard is one of the busiest trans-Alp routes – with regular queues of up to 10km long at each end during busy periods – A2 is notably one of the quieter motorways in Switzerland according to figures from FEDRO, the Federal Roads Office.